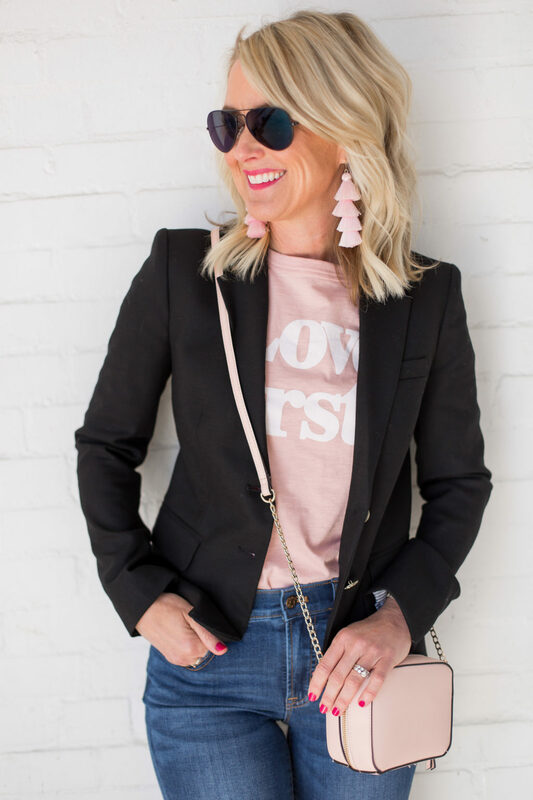 J.Crew on Amazon! 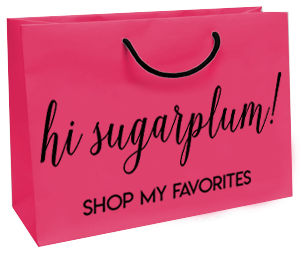 (Plus, 10 Easy Fall Styles) | hi Sugarplum! Hang on, what?! Yes, ma’am, you read that right! 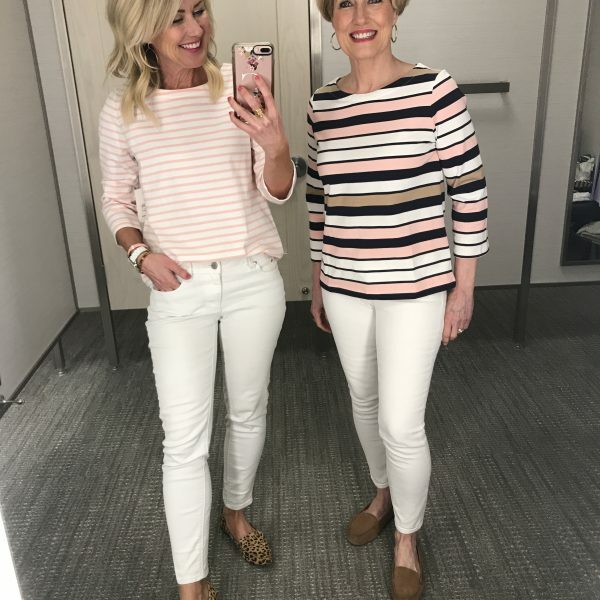 Now you can find all the best new J.Crew Mercantile styles, but with the Amazon Prime service, tw0-day shipping, and easy returns we love so much! I’m so excited to shop one of my favorite preppy brands, the best bed sheets, and facial razors (I’m obsessed with using these!) from the same place at the same time! Seriously y’all, is Amazon a game-changer, or what?! 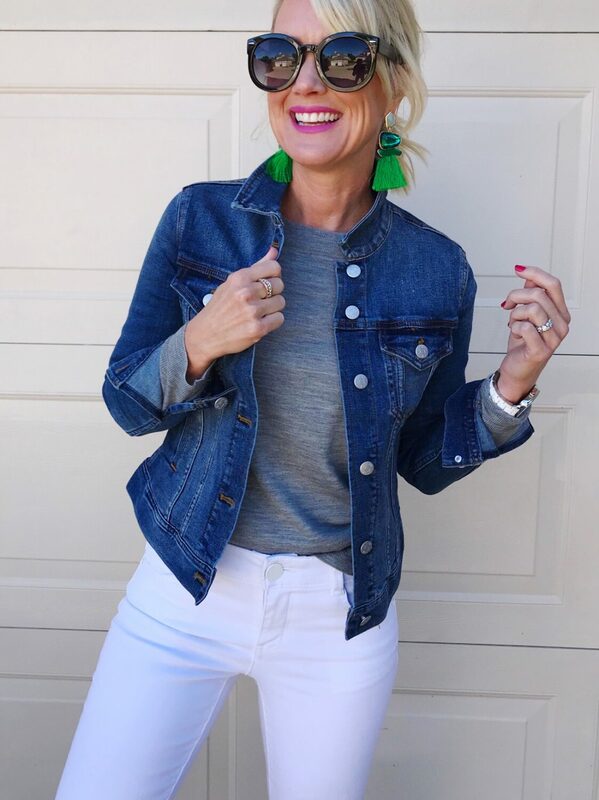 So many of my recent styles and Fall favorites are available now on Amazon…starting with this darling chambray popover. Man am I a sucker for a popover top. And this one is a great chambray with pleated front and small ruffle detail at the neck. So perfectly feminine! Fit Tip: I’m wearing a size 2. 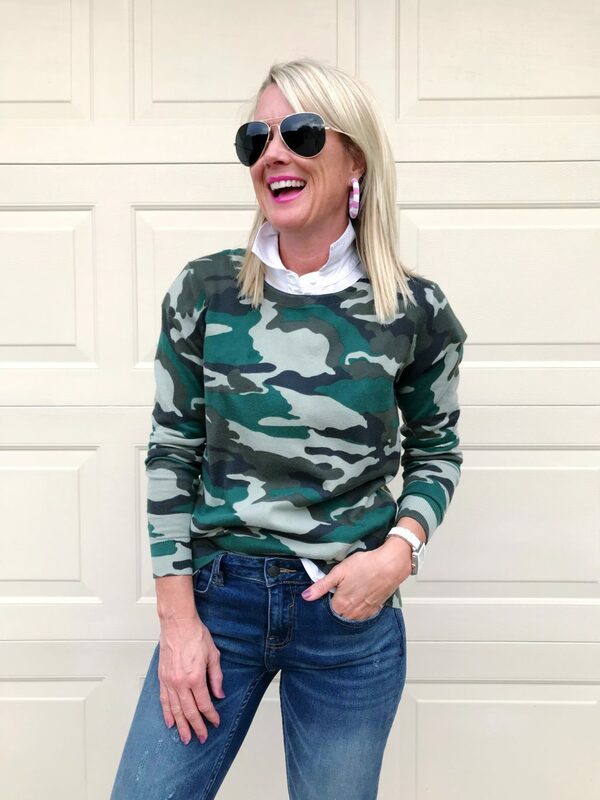 Y’all know I love camo, especially paired with pink (I’ve styled it several ways here and here)…it’s just such a fun pattern for Fall. This crewneck is a great, lightweight layering piece, too. Fit Tip: I’m wearing XS sweater and shirt. Every girl’s closet needs a jean jacket…mine actually has a few! I love the dark rinse and close fit of this one…perfect for layering over tees, thin sweaters, and dresses. 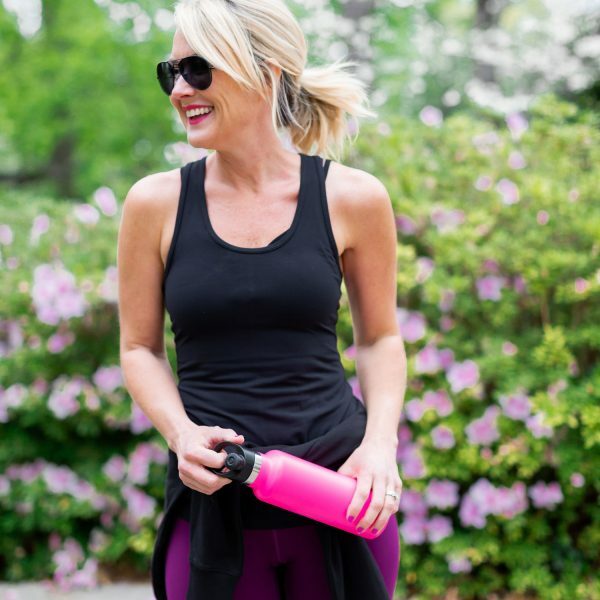 It’s extra stretchy for a tight, but comfortable, fit across the shoulders. And you see these fun earrings?? Only $10 and come in several color combos! Fit Tip: I’m wearing an XS, but size up if you plan to layer it over anything thicker. 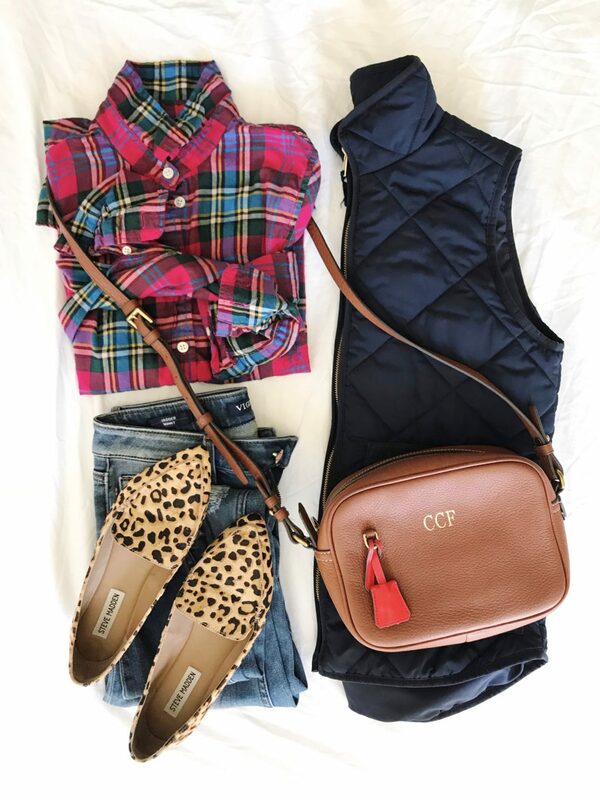 Plaid and Leopard….one of my favorite fall pattern combos! This plaid is flannely-soft, but still has a feminine fit. 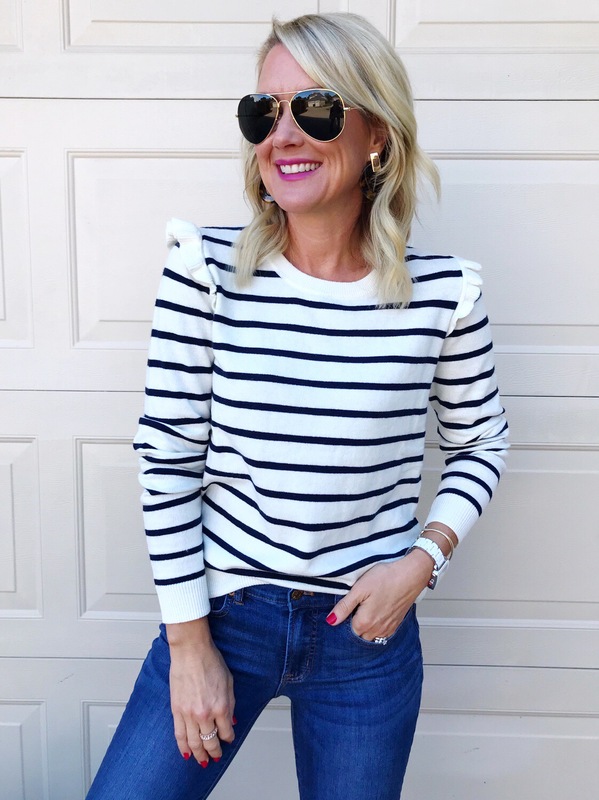 Stripes and ruffles…you know I’m in! This medium weight sweater is super soft, with a stretchy, forgiving fit. The ruffle detail gives it a little feminine touch, but is perfectly placed to not add bulk to your arms or shoulders. So cute with jeans, but transitions well for work with skirts and trousers, too. 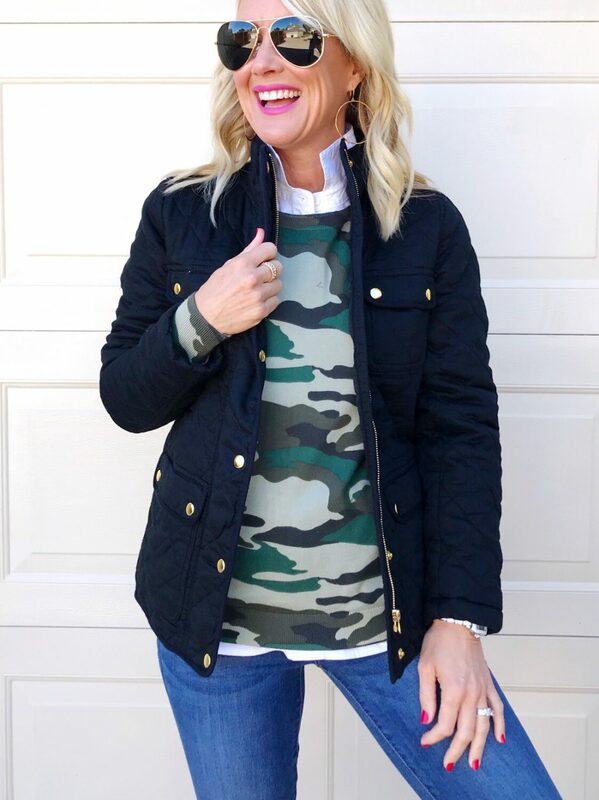 I’m obsessed with this puffer in the olive hue…just a like a military jacket, it goes with virtually everything! 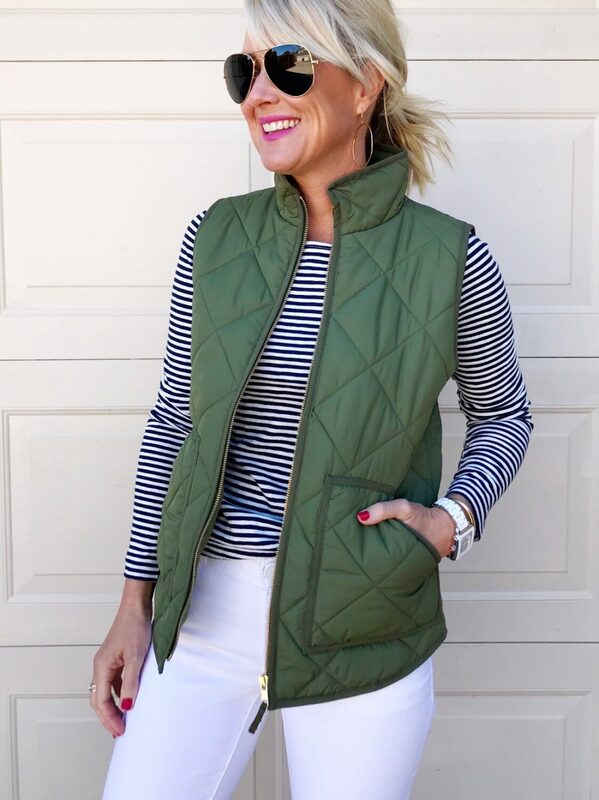 These are my favorite puffer vests for adding a cute layer, but not adding bulk, too. The green also looks great with with all shades denim, so it’s easy to throw on. Fit Tip: I’m wearing an XS vest, but size up in the striped tee. Camo again! This time I added another layer on top, and I’m crazy about this quilted field jacket! It’s soft and warm, but not bulky. The brass button jazz it up a bit, too. I pulled a few more styles you’ve seen recently, featuring fun J.Crew Mercantile pieces now available on Amazon…like this scalloped cami. Perfect worn alone in Summer, but a great layer under blazers in Fall. 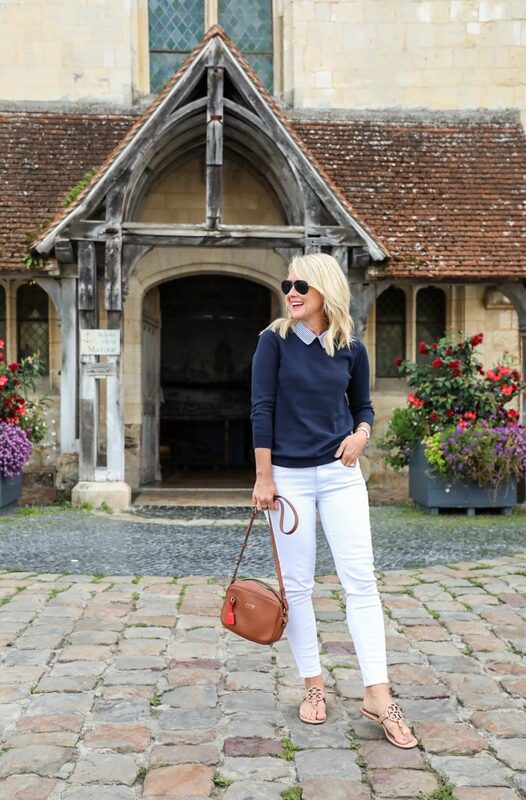 This darling 2-in-1 collared sweater I wore all over the British Isles (see here and here)…available in both navy and gray. Even the perfect shrunken schoolboy blazer is on Amazon!! It’s all on Prime, baby!! So exciting, right?! What’s your fave preppy combo from today? 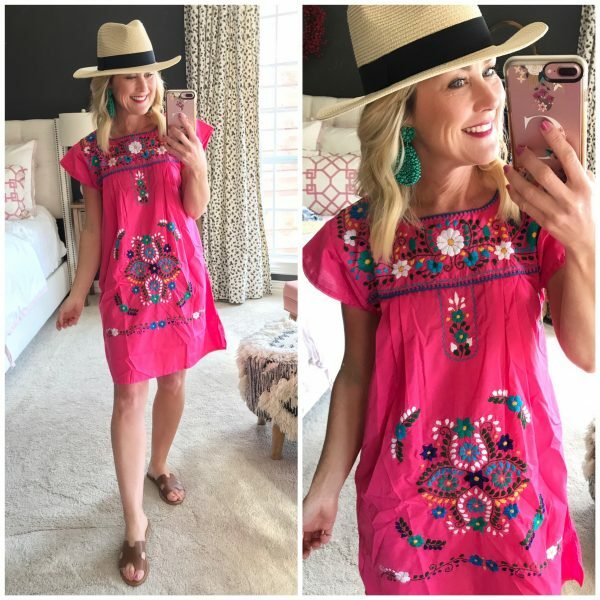 You can find all my J.Crew Mercantile finds in my Amazon shop for fast, easy shopping! See more of my Amazon finds here, here & here. As for my tried-and-true Amazon faves, here are my top finds. What’s on your list of Amazon best finds? 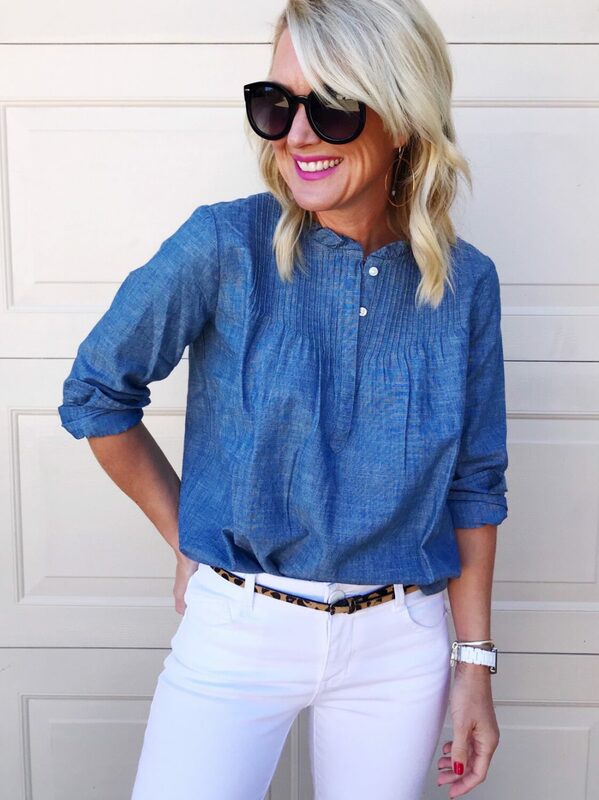 Oh, that Chambray shirt! Do all these looks ever go out of style? Never. J.Crew has quickly become my favorite brand so this is exciting! Next up Madewell, please! Ooooh, yes! Wouldn’t that be amazing!? The number one reason I resist a lot of the pieces at Jcrew is the shipping and returns hassle. This could be great news, I wonder if they will also have sales similar to the Jcrew site? Right!!?? I love the easy shipping/returning with Amazon. I’m not sure how they’ll handle sales, but I’ve seen the prices of pieces adjust according to the direct site, so hopefully that’s the plan! Loved everything, but my two favorites: striped sweater with ruffle on shoulder and camo sweater! SO CUTE! Hi, what size do you wear in the jeans? The site says they run small. Hi Leslie! I’m not sure which jeans, but I’m wearing my usual size 26 in all these! Sadly, the camo sweater is already unavailable online and in stores. Oh shoot! That sold out fast…fingers crossed for a restock soon! 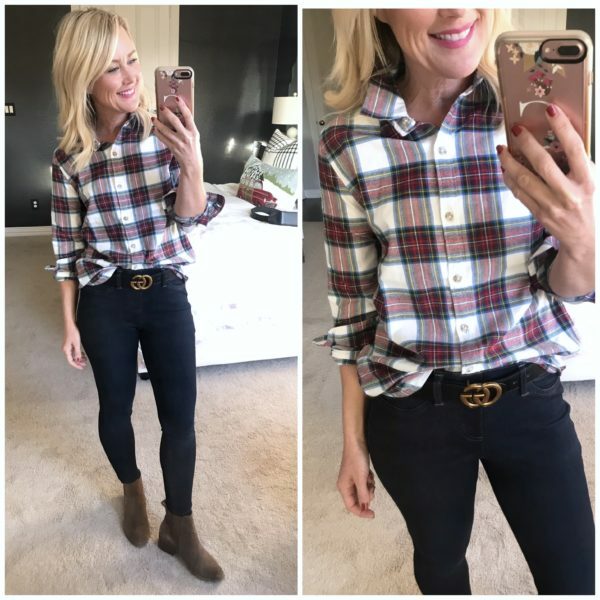 The link to the adorable plaid button down looks different that picture on the post. Is it the same shirt?? Happy and a little skeptical all at the same time, I love J crew but not sure if it being on Amazon gets me excited…. The clothing that I have purchased on Amazon wasn’t the best of quality. So wondering if it’s the same quality as you find in the stores…. Please be honest! What is the rule of thumb for leopard shoes and belt? Is it too much? There is no rule, per say…but I typically limit my leopard to one per outfit. Whether that’s in a belt, shoes, bag, scarf or top. I pull colors from the leopard for the accessorizing pieces. Hope that helps!